NEW YORK — On the opening day of a gathering of black leaders and voters in New York, two Texans seeking the 2020 Democratic presidential nomination delved into the issue of reparations for African Americans over slavery. Speaking at the four-day conference of the National Action Network, the civil rights organization founded by the Rev. Al Sharpton, former Texas Rep. Beto O’Rourke and former San Antonio Mayor Julian Castro weighed in on the topic. The question of whether to support reparations for African Americans as a means of addressing centuries of slavery and legal discrimination emerged as something of a litmus test earlier this year for Democratic presidential candidates. After a speech that at times drew on stories of civil rights history from O’Rourke’s hometown of El Paso, he was asked by Sharpton whether he would back a House bill that would create a commission to study the issue of reparations. He said equivocally that he would back the bill, sponsored this year by Democratic Rep. Sheila Jackson Lee of Texas. Later, O’Rourke said that he’d discussed the issue with Brian Stevenson, the executive director of the Equal Justice Initiative. “Foundational to reparations is the word repair, foundational to repair is the truth,” O’Rourke said. “Until all Americans understand that civil rights” also involves “the injustices that have been visited and continue to be visited on people, we will never get the change that we need to live up to the promise of this country. So absolutely I would sign that into law,” he said. O’Rourke is the latest 2020 Democratic presidential candidate to back the legislation. Castro, Sen. Elizabeth Warren of Massachusetts and Sen. Cory Booker of New Jersey also support it. “If, under our Constitution, we compensate people if we take their property, why wouldn’t we compensate people who were considered property and sanctioned by the state?” he asked the crowd. The annual Manhattan conference plays host to presidential hopefuls and other influential speakers each year. By the end of the week, a dozen Democrats running in 2020 will take the stage alongside Sharpton to make their pitch to black voters. While the candidates who spoke Wednesday drew distinctions on their views on reparations, they also discussed reforming the cash bail system, endorsed automatic and same-day voter registration, and voiced support for legalizing marijuana. O’Rourke also said that he would support reversing an order from the Trump Justice Department that restricted the federal government’s ability to use court-enforced consent decrees when state and local law enforcement agencies are accused of abuse. Filed in federal court and overseen by a monitor, a consent decree is generally a road map for changes in fundamental law enforcement practices. Civil rights groups have said the move by the Trump Justice Department rolled back progress made under the Obama administration. 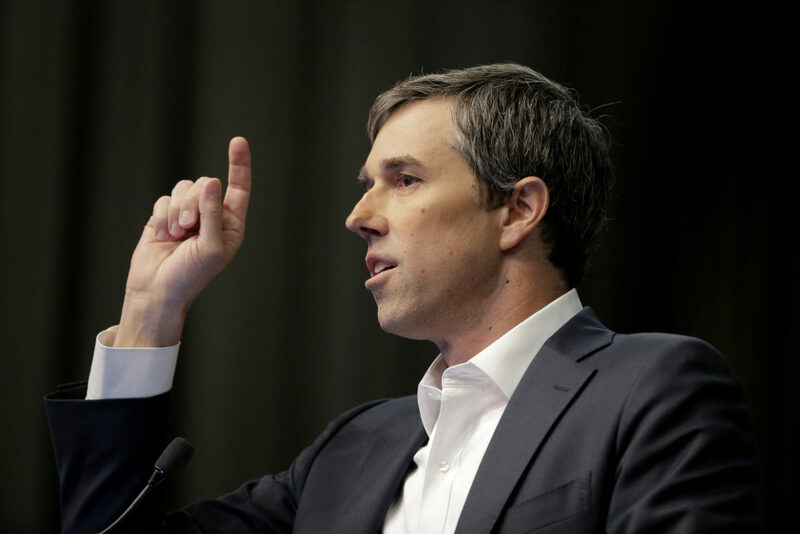 “There must be accountability for enforcement of the law, there must be accountability for use of force, and federal funds to local police departments and sheriff’s departments must be tied to accountability,” O’Rourke said Wednesday. Following his remarks, O’Rourke was asked by reporters about the scrutiny former Vice President Joe Biden is facing over his past behavior with women. Two women have said that Biden — who is considering a 2020 presidential bid of his own — had touched them in overly familiar ways. Biden has said he doesn’t believe he has acted inappropriately during his long public life but will pay attention to women’s experiences. “I think we need to listen to those who are raising their stories who have the courage to come forward,” O’Rourke told reporters.